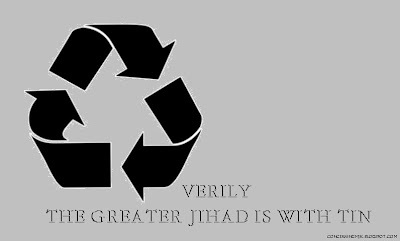 I really like the idea but I dont see the link between the recycling logo and inner jihad? Interesting.. reminds me of a shirt I bought a few yrs back (I think from Raiman) the Mujahideen one - The struggle within is greater? I would have centralized the font and put it below the recylce sign. I agree with Nafisa on font placing, i think you should put that trademark on t-shirt too. I will check how this t-shirt comes out before I try out the big venture of birthday present tshirt. I cant explain beyond that. the environment as an amanat always a necessary struggle. also, i only just got the imogen heap reference. Waseem - Is this one of those emo things;)? Irfan - ten points for the Imogen Heap idea - it comes back to my central question - what does Islam mean to me. Im going to articulate this into a blog soon.